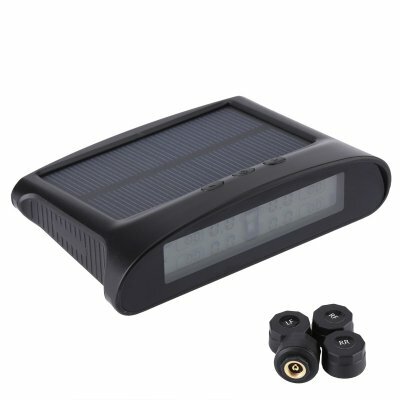 Successfully Added Tire Pressure Monitoring System - Solar Powered, USB Charging, 4 Sensors, IP67, LCD Display, Visual And Sound Alarm to your Shopping Cart. This tire pressure monitoring system keeps you constantly updated on the status of your wheels. From now on, you’ll always be aware of the pressure and temperature of your tires. This increases your safety on the road and allows you to save fuel while driving. At the same time, this real-time information allows you to prolong the lifespan of your wheels. The tire pressure monitoring system comes with four sensors. All sensors feature an IP67 design and are both water and dust proof. Its simple design makes this tire pressure monitoring system easy to install even for those without any technological knowledge. On its compact LCD display, you will be constantly able to read about the current status of your tires. The display itself is powered through a built-in solar panel. This makes the car gadget safe and environmental friendly to use. It furthermore lets you use it throughout the day without needing to worry about an empty battery. For those of you that live in places with limited hours of sunlight, this car accessory can also be charged via its USB port. As the chips with through wireless transmission, they can be installed without any further hassle. Thanks to the durable design of the sensors, this tire pressure monitoring system features an extremely long lifespan. It can furthermore be used in any weather condition. Whenever abnormal tire conditions are observed, both audio and visual alarms will sound. From now on, you can always be assured that your tires are in the best possible condition.